The Republic of Pisa (Italian: Repubblica di Pisa) was a de facto independent state centered on the Tuscan city of Pisa during the late 10th and 11th centuries. It rose to become an economic powerhouse, a commercial center whose merchants dominated Mediterranean and Italian trade for a century before being surpassed and superseded by the Republic of Genoa. The power of Pisa as a mighty maritime nation began to grow and reached its apex in the 11th century when it acquired traditional fame as one of the four main historical Maritime Republics of Italy. During the High Middle Ages the city grew into a very important commercial and naval center and controlled a significant Mediterranean merchant fleet and navy. It expanded its influence through the sack of Reggio di Calabria in the south of Italy in 1005. Pisa was in continuous conflict with the Saracens for control of the Mediterranean. In alliance with Genoa, Sardinia was captured in 1016 with the defeat of the Saracen leader Mujāhid al-‘Āmirī (Latin: Mogehidus). This victory gave Pisa supremacy in the Tyrrhenian Sea. When the Pisans subsequently ousted the Genoese from Sardinia, a new conflict and rivalry was born between the two maritime republics. Between 1030 and 1035 Pisa went on to successfully defeat several rival towns in the Emirate of Sicily and conquer Carthage in North Africa. In 1051–1052 Admiral Jacopo Ciurini conquered Corsica, provoking more resentment from the Genoese. In 1063, the Pisans approached the Norman Roger I of Sicily, who was conducting a campaign to conquer Sicily that would last over three decades, with the prospect of a joint attack against Palermo. Roger declined due to other commitments. With no land support, the Pisan attack against Palermo failed. In 1060 Pisa engaged in its first battle against Genoa and the Pisan victory helped to consolidate its position in the Mediterranean. Pope Gregory VII recognized in 1077 the new "laws and customs of the sea" instituted by the Pisans, and Holy Roman Emperor Henry IV granted them the right to name their own consuls, advised by a Council of Elders. This was simply a confirmation of the present situation, because at the time the marquis of Tuscany (the nominal feudal sovereign of Pisa) had already been excluded from power. 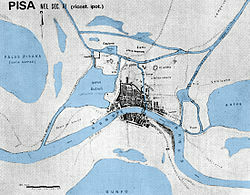 Pisa sacked the Zirid city of Mahdia in 1088. Four years later, Pisan and Genoese ships helped Alfonso VI of Castile force El Cid out of Valencia. In 1092 Pope Urban II awarded Pisa supremacy over Corsica and Sardinia and at the same time elevated the Diocese of Pisa to the rank of metropolitan archdiocese. 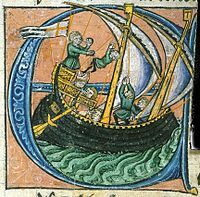 A Pisan fleet of 120 ships participated in the First Crusade and the Pisans were instrumental in the siege of Jerusalem in 1099. On their way to the Holy Land the Pisan ships did not miss the opportunity to sack several Byzantine islands. The Pisan crusaders were led by their archbishop, Dagobert, the future Latin Patriarch of Jerusalem. Pisa and the other maritime republics took advantage of the crusade to establish trading posts and colonies in the eastern coastal regions of Syria, Lebanon and Palestine. In particular the Pisans founded colonies in Antioch, Acre, Jaffa, Tripoli, Tyre and Latakia. They also established other territorial possessions in Jerusalem and Caesarea, in addition to smaller colonies (with lesser autonomy) in Cairo, Alexandria and of course Constantinople, where the Byzantine Emperor Alexius I Comnenus granted them special mooring and trading rights. In all these cities the Pisans were granted privileges and immunity from taxation, but had to contribute to their defence in case of attack. In the 12th century the Pisan quarter in the eastern part of Constantinople had grown to 1,000 people. For some years of that century Pisa was the most prominent merchant and military ally of the Byzantine Empire, surpassing the Republic of Venice itself. In the Western Mediterranean, though Pope Gregory VII had granted suzerainty over the Balearic Islands to Pisa in 1085, and Pisan merchants were among the initiators of the 1113–1115 Balearic Islands expedition, they were unsuccessful in permanently dislodging the Muslim taifa there. Pisa, as an international power, was destroyed forever by the crushing defeat of its navy in the Battle of Meloria against Genoa in 1284. In this battle, most of the Pisan galleys were destroyed and many of its mariners were taken prisoner. In 1290, an assault by Genoese ships against the Porto Pisano sealed the fate of the independent Pisan state. Between 1323 and 1326 Pisa was also driven out of Sardinia by the Crown of Aragon. As part of Gabriele Maria Visconti's dominions after 1399, Pisa was then sold to Florence in 1402. After a bloody and useless resistance, the municipality was at last subjugated in 1406. ^ Charles Julian Bishko (1975), "The Spanish and Portuguese Reconquest, 1095–1492", A History of the Crusades, Vol. 3: The Fourteenth and Fifteenth Centuries, ed. Harry W. Hazard (Madison: University of Wisconsin Press), 405. Wikimedia Commons has media related to Republic of Pisa.